Where Did the Nationals Go Wrong? The Nationals’ season isn’t quite on life support, but there’s been a bad accident, and the family’s been notified. The situation appears to be dire, and while Tuesday brought its own fresh horrors, that wasn’t the day that slaughtered the dream. It’s the most recent event, the currently most upsetting event, but the Nationals weren’t even supposed to be in this situation in the first place. They’ve had problems for weeks, for months, and now they’re about out of time to save themselves and move on to the tournament. The Mets have simply done too much. The Nationals have simply done too little. The story would be interesting if it were any division race. What makes this one extra interesting is that it’s this division race. The Nationals were expected to run away with the NL East. The Phillies, as assumed, have been bad. The Braves, as assumed, have been bad. The Marlins had the look of being mediocre. The Mets had the look of a fringe contender. The Nationals had the look of a champion. These are our preseason odds. The Nationals were given an 86% chance to win the division. They were projected to clear the Mets by 13 games. If the Nationals won out, and the Mets lost out, the Nationals would clear the Mets by 18 games. This was supposed to be a relative cakewalk. It’s been more of a…nailwalk? I don’t know. It’s been bad, is the point. So: why? How has this happened? Obviously, the Mets have quite a bit to do with it, but this post is to focus on the Nationals. Where did this go wrong? You’ll observe that this post has a lot in common with this other post, about the also-disappointing Mariners from the end of July. I like the format well enough, as I think it works to capture the good and bad surprises. Getting right to it, the Nationals are 71-67. Plugging in the preseason projection, we thought at this point the Nationals would be 81-57. There’s a 10-game difference right there, which is clearly enormous. How could we explain half of that? It’s interesting to look at the BaseRuns standings. Based on those estimates, both the Nationals and the Mets should be 76-62. They definitely are not, with the Mets one game better, and the Nationals five games worse. That’s the whole difference between first and second place, coming just out of sequencing. Some of that, I’m sure, people are more than happy to pin on Matt Williams. He’s presumably not all of it. Whether it’s just bad luck or bad timing, the Nationals have sort of gotten it in the shorts, and that’s a reason why their hopes are fading. But even 76-62 would be short of the preseason expectation. Remember, the Nationals weren’t supposed to be about as good as the Mets; they were supposed to be a lot better than the Mets. Where can we find those other five missing wins? The answers are in the graph below. What we have right now are individual player performances for 2015. What we had months ago were projected individual player performances for 2015. So this makes for an easy comparison, taking the projections and putting them over 138 games instead of 162. Then we can compare actual and projected performances, and see who’s over-achieved, and who’s under-achieved. My statistic of choice is WAR, and while, yeah, I know, flaws and everything, WAR’s the best we’ve got, and nothing else is close. This graph contains most of what’s important. It’s built from preseason depth charts, preseason projections, and actual performances. Data going into that graph: 39.3 projected WAR, and 32.8 actual WAR, for a difference of -6.5 wins. Unseen are some surprise contributors, like Joe Ross. Players who didn’t appear in the preseason depth chart. Those players have combined for 1.6 WAR, so then that leaves us at -4.9, or, better, 5. Here are your five missing wins, as we’ve been looking for. 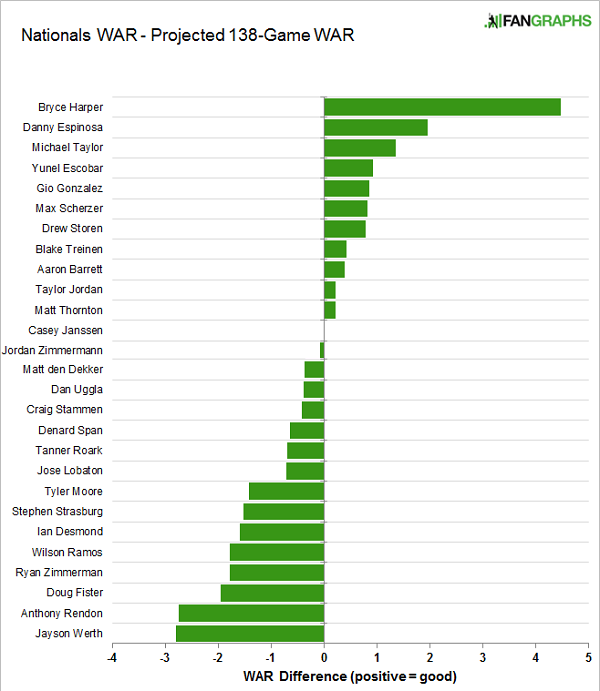 I don’t think anything should really come as a shock, but this lists it out player by player. The thing that really stands out to me is Bryce Harper. I think we’ve all talked about this, but one of the craziest things about the Nationals’ disappointing season is it’s also a season where Harper has had one of the better performances in recent history. He’s broken through, achieving the Mike Trout tier, resembling one of the most complete players in the game, and still the team has struggled around him. It would’ve made sense to say that, if the Nationals were going to disappoint, Harper would probably be hurt. Instead, he’s beat his projection by 4.5 wins. Put another way, he’s more than doubled it. Think about what that means for the supporting cast. Danny Espinosa‘s done more than expected. Yunel Escobar, too. Michael Taylor has awesome defensive numbers. But this graph quickly turns sour. Or, bitter, if you like sour. There are the littler disappointments, like the injured Denard Span. There are the quieter disappointments, like the underwhelming Tyler Moore. Then there are the star-level disappointments. The Nationals were supposed to have an excellent core. Much of that core has under-achieved. Obviously, some of that is directly due to injury. Some more of that is due to lingering effects of injuries long since healed. But, Jayson Werth has been either hurt or bad. Anthony Rendon has been either hurt or average. Stephen Strasburg’s been a little bipolar. Doug Fister came apart. And on, and on. For the sake of example: Harper has beat his projection, so far, by 4.5 wins. That’s a massive, massive gift. Yet Harper’s breakthrough has been more than negated by Werth and Rendon. Combined, they’re at -5.5 wins, and though some of the time they missed went to occasionally productive fill-ins, those fill-ins don’t have the skills to match what a healthy Werth or Rendon could do. Fister has completely negated the Espinosa surprise. Even just Tyler Moore cancels out Joe Ross emerging from the shadows. Nothing is really that much of a surprise, but the embedded image shows how a team can blow one of the most impressive individual breakthroughs we’ve ever seen. It’s hard to blame the Nationals for the bad injury luck they’ve experienced, and in that sense it’s been a little out of their hands, but it’s not all injuries. And it’s not like the Mets haven’t had injuries too, not that theirs have been quite as damaging. The injury explanation is valid, but it’s only partial, and the Nationals have the rest to answer for. I’m sure they’ve been searching for those answers for weeks. It’s kind of funny — right now, the narrative is that the Nationals are a colossal disappointment. If it weren’t for sequencing, the Nationals and the Mets would be tied, and maybe the story would be more about how that Nationals have overcome adversity to remain competitive. Even in a season this disappointing, it’s arguably just cluster-luck keeping the Nationals out of a share of first. But then you get the Matt Williams effect, and that’s not just luck. The Nationals were supposed to be sufficiently good that no one would pay too close attention to their manager. That is not the way that it’s gone, I’d say. We hoped you liked reading Where Did the Nationals Go Wrong? by Jeff Sullivan! Cluster-luck is very close to a good description of the Nationals’ season so far.